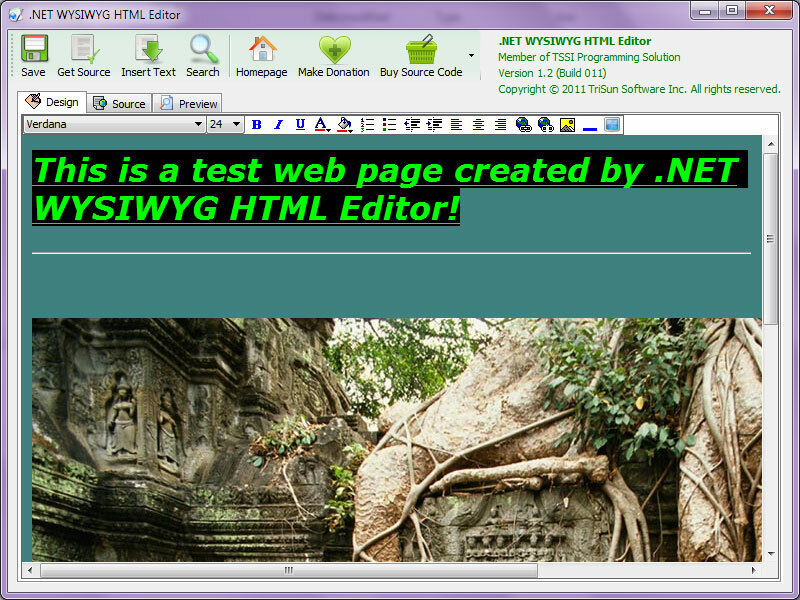 .NET WYSIWYG HTML Editor is 100% freeware that used to design the HTML pages. It has 3 modes: 'Design' - the WYSIWYG HTML editor, 'Source' - view or write HTML code manually, 'Preview' - see the actual effect. It provides you with the following features/functions: save to HTML file, get HTML source code, insert text from .txt or .html file, search text, font name, font size, bold, italic, underline, text foreground color, text background color, numeric items, symbol items, decrease indent, increase indent, align left, align center, align right, add hyperlink, remove hyperlink, add image, insert horizontal line, set and remove background color/picture/sound. At last, you can get the .NET source code of this free editor with a little fee. Supports to edit in IE9+ systems. Fixed: homepage link is bad.